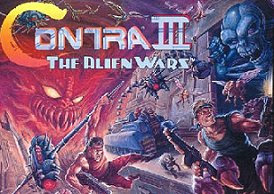 Contra III: The Alien Wars is a great game pure and simple. If any of you have failed to play it back in the SNES days, then this is a sure bet for the VC on the Wii. This game has it all: explosions, cools weapons, awesome creatures and great graphics and music. Team up with a friend and take on the world that has been overrun by Aliens bent on dominating the human race. Of the six levels available I must say that while they are all great, my favorite has to be level 4 with the motorcycle race and the missile rides. Back in 1992 when this game was first released, there was not much more of an adrenaline rush than this for a home console. While new games have watered down the first feel of this game, Contra III is still a blast to play whether by yourself or with 2 players. Oh and the glorious music is going to stay in your mind as well-a truly epic soundtrack for a Super Nintendo game. Contra III had some of the best graphics for the SNES when it was released as well. Mode 7 airplanes and rotating top down levels gave the game a lot of pizazz. 800 Wii points is a small price to pay for this classic game.